Swimwear is the focus of Part 2 of 3 in the Resort Wear 2017 series. We’ve got four looks for you today that cover a range of personal style types. First up is a romantic/feminine look. This suit has been a favorite of mine on Pinterest. It’s a simple, classic style made romantic by the addition of crochet trim. A ruffled white tunic cover-up, embroidered straw bag and tasseled flip-flops complete this feminine girl’s look. Our fun girl likes brights so this look has them in spades! 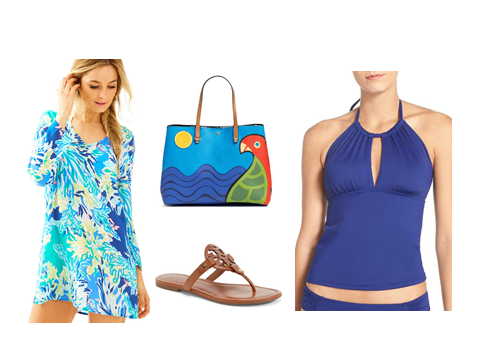 The deep royal blue of the tankini swimsuit ties together with the various blues in the print cover-up and tote bag. A neutral shoe keeps the look from getting too chaotic. This sophisticated look has a bit of an edgy vibe due to the snakeskin print of the cover-up and the molten metal tones of the swimsuit and tote. Lastly, for our sporty look, we chose a fuller coverage hipster bottom/ high neck halter top swimsuit and paired them with a comfy/casual pair of beach pants. The SeaBags tote is made from recycled race sails!